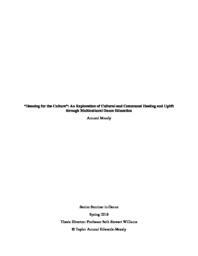 This work explores the use multicultural dance education as an instrument for uplifting students of color who have been socially and cultural marginalized and for building community through cultural understanding and cultural empathy. The project explores research on key pedagogical terms and findings from four educational fieldwork sites to show how dance can be powerful beyond creative expression. It can also manifest sociocultural empowerment, understanding, and unity.